A couple with young children living in the west Highlands claim they are being forced to leave their “dream” rent-to-buy home after complaining about mould and damp. Shona and Gillespie MacDonald live in the two-year-old house in Strontian with their three children – but say the damp conditions are forcing them into a private rented house. However, the owners of the property, the Highland Small Communities Housing Trust (HSCHT), say it has not been able to access the property to check the complaint and, until it does, would find it difficult to comment. In an area where a lack of housing comes at a premium, the couple are leaving their let-to-buy house and taking on another property because they claim the damp conditions they are experiencing are causing health problems to their children. 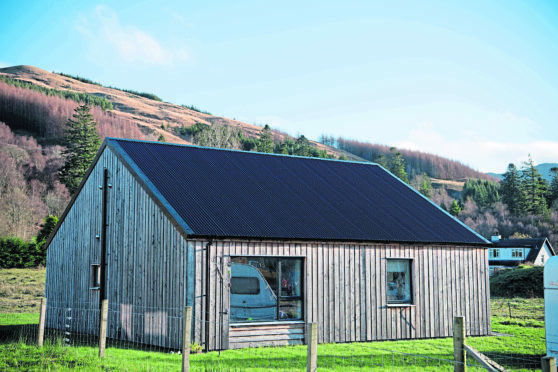 Mr MacDonald said: “My family and I are currently in a newly-built affordable rent to buy home in the village of Strontian. We moved into this house end of January in 2017. “The house had mould by last November. We have a daughter whom is now 19 months and her cot is now showing signs of dampness and she has suffered a cough for months and months, now usually always through the night. “We also have two older children living at home with us, one of whom suffers with asthma. As you can imagine this is affecting his health too. Mrs MacDonald added: “This was our forever home and we are so disappointed that there are so many problems with it that are forcing the move. Ronnie McCrae for the Highland Small Communities Housing Trust said he was disappointed to hear about the MacDonald’s plight. He said: “We don’t want to build homes that people can’t live in. We have tried to get into this house to see what the problem is, but so far we have been unable to do so.